PROTECT YOUR SKIN FROM UV RAYS. We’re dedicated to enhancing your everyday adventures with clean, simple products you can trust. At Bare Republic, we believe everyone should have the tools to fully enjoy a healthy life. That’s why we are committed to creating safe, effective products that are fun and accessible to all. We’re a group of friends from California with a shared passion for health, wellness, and adventure. As our own families grew and we began searching for clean products that would support our lifestyle, we realized that healthy products were too expensive or didn’t feel good, and the Bare Republic journey began. Today, the adventure rolls on as we continue our quest to bring simple, safe, and effective solutions in the hands of everyone. Good clean fun for all life's adventures. Some say that we're all a product of our environment. As a result, we demand a product that can protect our skin without compromising our health, performance - and most importantly - the very spots we like to play in. Bare Republic’s healthy, eco-active Mineral Sunscreens are formulated for the entire family. Unprotected exposure can lead to premature skin aging and wrinkling (photoaging), and suppression of the immune system. UVB rays will usually burn the superficial layers of your skin. It plays a key role in the development of skin cancer. The intensity of UVB rays vary by season, location and time of day. Products that pass the broad spectrum test provide protection against both ultraviolet B radiation (UVB) and ultraviolet A radiation (UVA). A certain percentage of a broad spectrum product’s total protection is against UVA. The Critical Wavelength of the adjacent test for our Bare Republic Mineral Face SPF 30 product is 374.00 nm, and satisfies the criteria for “Broad Spectrum” labeling (minimum of 370 nm required). MINERAL ACTIVE INGREDIENTS: BIODEGRADABLE AND REEF-FRIENDLY! Mineral Sunscreens are differentiated by their active sun protection ingredients. 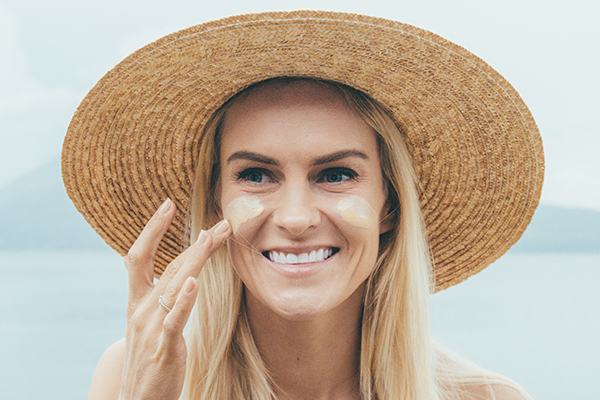 Mineral sunscreens use mineral (also commonly referred to as “physical”) active ingredients such as Titanium Dioxide and Zinc Oxide to scatter and reflect UVA/UVB rays. They sit on the surface of your skin, and are biodegradable and reef-friendly. All of Bare Republic Sunscreens are free of active chemical sunscreens, and utilize mineral active UV filters only. A 10 person in-vivo test, in which water resistance is presented as a comparison of initial SPF and water-exposed SPF by immersion. Based on test results, a passing SPF product may display: Water Resistant (40 Minutes) or Water Resistant (80 Minutes).